This is only the third tutorial I've ever written for Paint Shop Pro, but I was encouraged to write it by 2 friends of mine in the graphics community. I would like to thank both for their tutorials and suggestions that inspired me to create these Gradient Kaleidoscopes in the first place, and then to write this tutorial on how to make them into tileable backgrounds. Thank you Nanson for your great mini-tutorial/suggestions on how to use PSP's Spiky Halo to create these kaleidoscaopes, and thank you Shelly for youe great tutorial on fractal image background tiles that helped me make the resulting kaleidoscopes tileable. Unfortunately, Shelly's tutorial site is down at the moment for redesigning, so as soon as she has it back online, I'll be putting a link to it back here on this tutorial page. OK, the first thing you will need to do is download the gradient we will be using for this tutorial. Raspberry Metallic Gradient. Unzip your downloaded gradient into your PSP Gradients folder on your hard drive. If you want to make other gradients to use with this tutorial and don't know how to go about it, check out my New Gradients Tutorial. Once your new Raspberry Metallic Gradient has been installed, open a new graphic, 200 x 200, transparent background, 16.7 million colors. 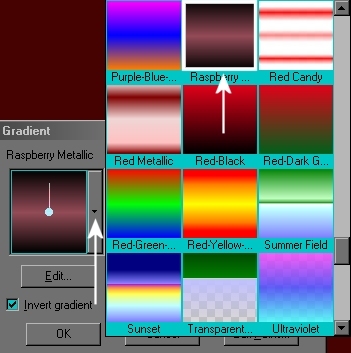 Select your Raspberry Metallic Gradient by clicking on the foreground color fill style (which you should now have set to gradient), and PSP will automatically generate your gradient cache, and then display a small dialog box where you will select the Raspberry Gradient by clicking on the long narrow button with the down arrow to the right of the gradient view window (see screenshot 2). Then slide the scroll bar to find the Raspberry Metallic gradient and click on it to select it. 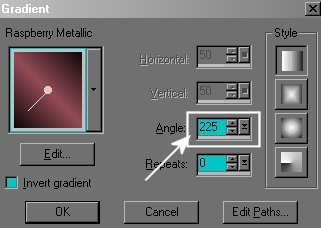 The next thing we're going to do is change the Angle attribute of our selected gradient by changing the Angle number to 225. (see screenshot 3). Now on to Page 2 to start learning how to create these great tiles.